Blue Knight Ryan Lutinski finished with two hits and three RBI’s. 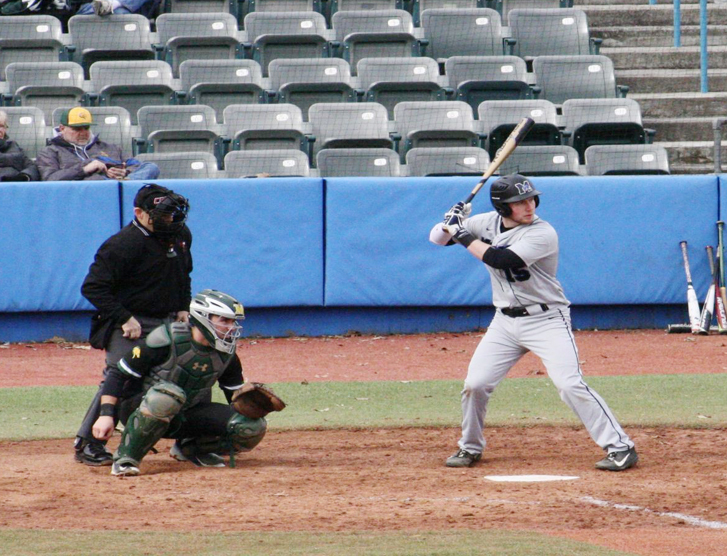 MERRITTPALISADES PARK, N.J. – The Mount Saint Mary College Baseball team finished off the weekend with a sweep of Yeshiva on the road on Sunday afternoon. The Knights scored 26 runs over the two games of the doubleheader as the Mount won game one 17-0 in seven innings while winning the nightcap 11-4. The Knights found themselves on the scoreboard early and often in game one as the Mount scored four runs in the top of the first. After walks by Steven Mirra and Michael DiGiovanni, Nick Rizzo singled down the left field line to score Mirra. Rizzo later scored on an error and Justin Maldonado singled home two with two outs in the first. Mount Saint Mary loaded the bases again the second with nobody out as Matt Barbieri drove a run in with a groundout and Liam Merlin picked up a RBI on a sacrifice fly to left. In the top of the fifth, Jack Goodwin led off with a single, stole second and scored on a Yeshiva throwing error on a Maldonado bunt. Mirra followed it up with a RBI single to right and Chris McLaren scored on a passed ball to push the lead to 9-0. The Mount struck for six more runs in the sixth as Barbieri scored on a throwing error off of a sacrifice bunt by Goodwin. Merlin later scored on a wild pitch after reaching on a single and Robert Brust knocked two in with a double to left field. Devin Tait picked up his first RBI of the day on a single to left to score Brust. Rizzo picked up his second run batted in of the day on a sacrifice fly to center field with one out. The Knights picked up two more runs in the seventh inning after a Maldonado RBI single and Anthony Rizzo scored on a wild pitch. Christian Spano picked up the win for the Knights, throwing five innings and allowing zero runs on four hits. Robert Worden and Andrew Connors each tossed a scoreless inning in relief and struck out two apiece. Rafi Jacobs took the loss for the Maccabees as he tossed five innings, allowing nine runs (three earned) and seven hits. Maldonado finished 2-for-3 with three RBI and two runs scored while Brust and N. Rizzo each had two RBI. Goodwin finished with three runs scored for the Knights. Five different players finished with a hit for Yeshiva. The Knights got on the board in the first inning once again as Tait laced a single to center and N. Rizzo was hit by a pitch with one out. Tom Huvane drove a double to left field with two outs to plate both Tait and N. Rizzo to give the Mount an early 2-0 lead. The Mount added another run in the second when Jasper Bradley had a leadoff triple and Ryan Lutinski knocked him in with a sacrifice fly. Yeshiva took its first lead of the day with four runs in the bottom of the fourth. After the Maccabees loaded the bases with one out, Zachary Baly laced a bases clearing triple to right field that tied the game at three. Aryeh Salovey singled through the right side with two outs to score Baly and give the Maccabees a 4-3 lead. Mount Saint Mary responded with a crooked number of its own in the fifth as the Knights plated seven runs in the inning. Tait singled home Mirra for his second run batted in of the day and Barbieri came through with a pinch-hit RBI single to put the Mount back on top. Huvane picked up his third RBI on a fielder’s choice and Anthony Franco knocked in Barbieri on a sacrifice fly. The Knights pulled off a double steal to score Huvane while Lutinski and A. Rizzo both had RBI singles with two outs to give the Knights a six run lead after the top of the fifth. Lutinski added a third RBI of the day in the seventh when he singled home Franco on a base hit to left field. DiGiovanni earned the win in relief as he tossed 3.2 scoreless innings and struck out five. Matthew Borriello started for the Knights and took a no-decision. Mordechai Cohen took the loss for Yeshiva as he gave up ten runs (seven earned) and 11 hits over five innings of work. Lutinski, Mirra and Tait each finished with two hits while Lutinski had three RBI. Bradley, N. Rizzo and Tait each had two runs scored with the Knights stealing eight bases in the contest. Baly finished 3-for-4 with three RBI and a run scored for the Maccabees. At 10-11 overall and 4-6 in the Skyline, the Mount returns to action in a non-conference home contest against Manhattanville on Wednesday afternoon. First pitch with the Valiants is scheduled for 4:00 p.m. at Dutchess Stadium.